The version 1.6 was submitted for review to Apple on November 28th, 2010. Minor bugs with GPS device are fixed. The user can properly zoom in/out on the map. The settings layout has changed a little bit! If the accuracy is "<10", iTopography will acquire the best accuracy that the iPhone is capable of. On an iPhone 4 this is 5m. If the "Spherical Coordinates" is on, iTopography will compute distance and angles based on Euclidean geometry. If it is off, iTopography will use the spherical trigonometry to calculate the angles and the distances (in this case, the altitude is not considered in the calculations). Note, that the map is drawn based on the assumption that Earth is a sphere. The calculation of the area is not affected by this choice, but the perimeter is. If the user decides to disable the GPS device, then he/she can manually add points by either inserting the distance between the points or inserting the Longitude/Latitude of the points. 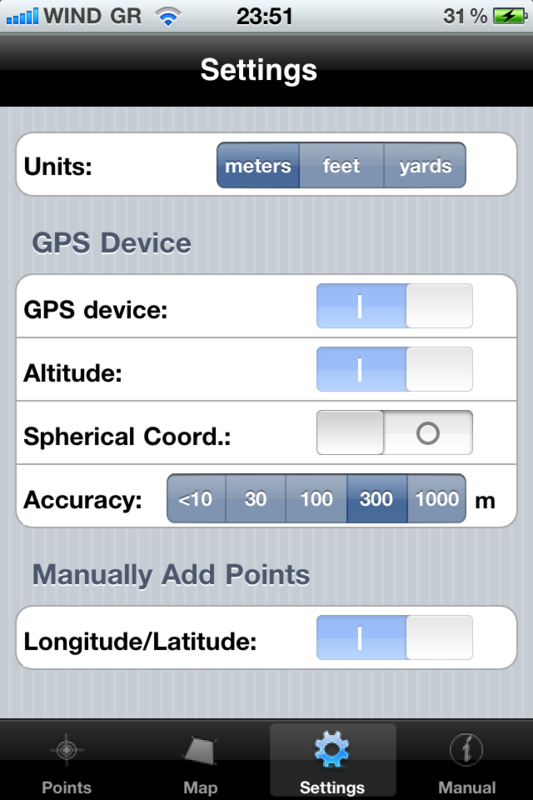 If the user wishes the latter, he/she would have to disable the GPS device and enable the "Longitude/Latitude". 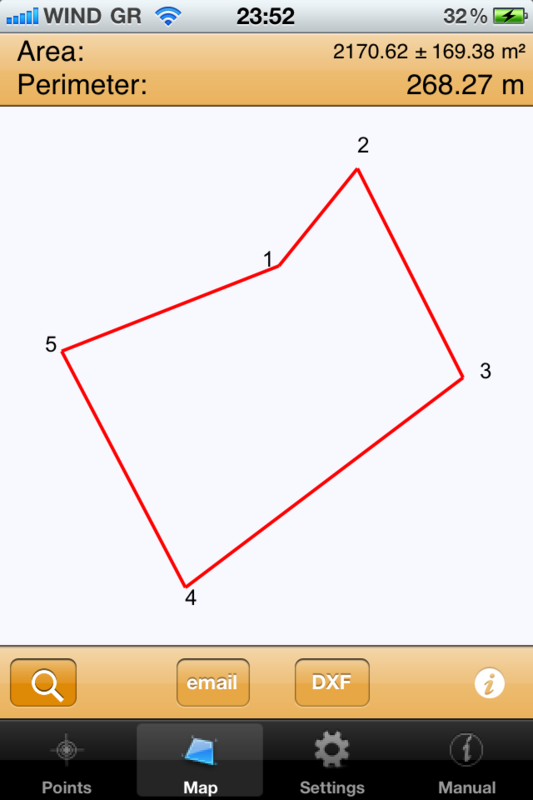 Based on the configuration in this figure, the GPS device is on and iTopography uses spherical trigonometry to calculate angles and distances. Now, the user can rotate the image by placing two figures on the screen (i.e. thumb and index finger) and moving the index finger, while holding the thumb at the same position. The user can move the map by dragging one finger on the map. Finally, the user can zoom in/out on the map by pinching the screen.